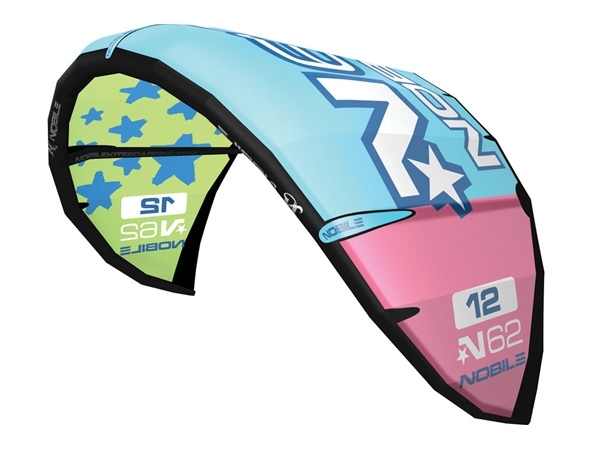 The new N62 is an ideal kite for riders who value ease and simplicity in their kiting, and for those who ride in demanding conditions where control is paramount. The new N62 delivers the latest generation of innovative design into the Nobile kite range, it's compact shape and reduced aspect ratio offer super stability, as well as delivering easy power control, direct handling and instant relaunch. The N62 V2.0 features reduced sweep through the wing tips (compared to a traditional delta), ensuring phenomenal low-end performance, massive wind range and pivotal turning without the indirect, imprecise handling of a traditional delta. This kite delivers “Park and Ride” ease, allowing you to just concentrate on riding. It is extremely forgiving due to an excellent 'sink back' characteristic (the ability to drop back into the wind, instead of luffing and falling out the sky, should you get yourself too far under the kite). The N62 V 2.0 also benefits from the excellent performance, quality and safety characteristic of the innovative Nobile Kiteboarding control bar and the revolutionary Fulcrum quick release. Whatever your style or ability and whatever the riding conditions are, the new N62 introduces a new era of versatility and all-terrain performance. • Impressive Relaunch – voted best relaunch by SBC Kiteworld!